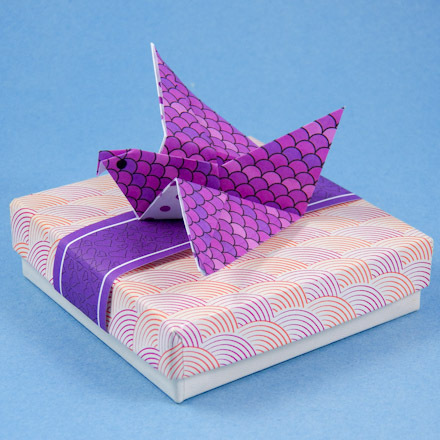 In this project, you'll see how to transform a square of paper with a few folds into a bird that can be used on a gift package in place of a bow. The flying bird has fewer folds than most origami birds, including the classic origami crane. This makes it an ideal origami craft project for beginning folders and children. The birds can also be used to decorate a party table or dress up a flower arrangement. 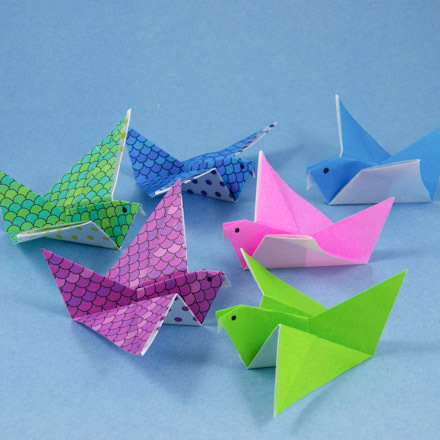 Make one bird or a whole flock of birds! 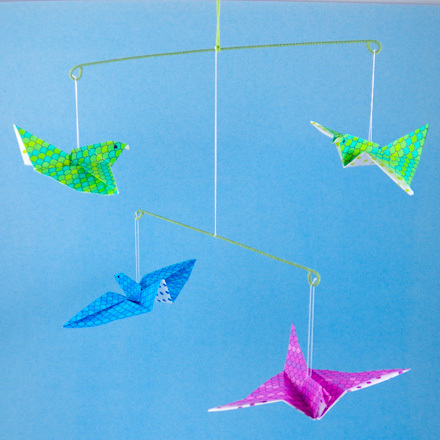 Related craft: See the Floral Wire Mobile craft project to see how to make a mobile with your origami flying birds! Related craft: For another simple origami model, see the Jumping Origami Bunny craft project! Commercial 4" (10 cm) origami squares in bright colors are ideal for folding the flying birds; however, other lightweight paper works well, too. Simply cut 4" squares from any colorful paper you have on hand; just be sure it's no heavier than computer paper. It's important that the paper is cut in precise squares, but they can vary from 4". Tip: You can create your own colorful paper by printing Aunt Annie's ePapers on one or both sides of white computer paper. The Animal Scales ePapers work particularly well. Carefully follow the folding instructions, using the illustration as a reference. The dashed lines indicate folds, while the red lines show creases already made. The red arrows are the direction of the folds, and the black curly arrow means to turn the folded paper over. Make a diagonal crease. Fold the square in half, corner-to-corner, then unfold. Fold the paper in half on the other diagonal. Leave folded. Fold the top layer back along the dashed line, so that the edge meets the fold. Flip the paper over. Fold in half on the dashed line to form a smaller triangle with a partial flap on top. Open the flap to form a point. Gently pull the point of the flap up while folding the entire top layer in half to form the new point. The points are the bird's head and tail—the new point is the head. Create the first wing by folding the top layer up to form a 90° angle between the head and the wing. Fold the bottom layer back in the same manner to form the other wing. Fold both wings down along the dashed lines to make the bird look as if it is flying! Push the front point on the head in and crease to form the bird's beak. Tip: Add eyes to the bird with a black marker. That's it! 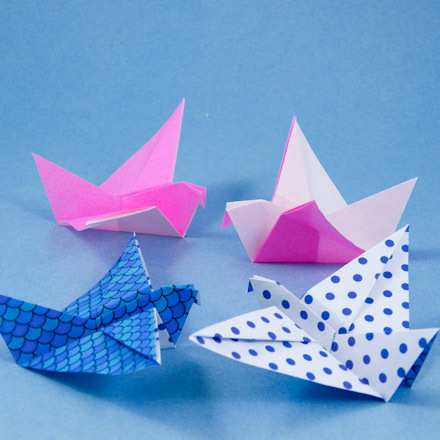 Make a whole flock of origami flying birds! 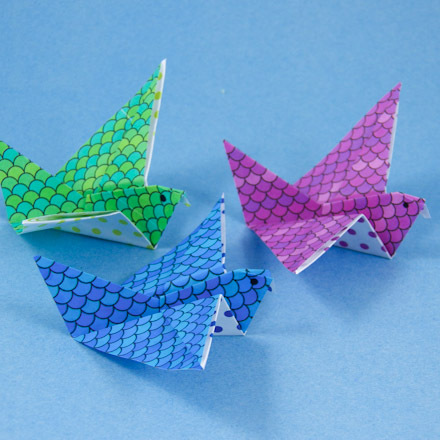 Tip: Use printed computer paper cut into squares to make origami flying birds. The birds above are made with Animal Scales ePapers printed on one side and Cool Color Polka Dots ePapers on the other side. Thanks to Angel for sharing this craft idea with Aunt Annie's Craft Exchange in 1997. Tip: Pick which side of two-sided paper goes on top of the bird by folding that side inside the folds—like the yellow side in the illustration. Tip: Make a mobile with your origami flying birds. See how in the Floral Wire Mobile craft project.